Get the latest news from GU Health, updates on the corporate health insurance industry and understand the issues that affect our members. The Minister for Health has announced the approved 2019 rates increase for all registered Australian health funds, effective from 1 April 2019. The rate review takes into account a range of factors such as the rising cost of healthcare services due to advances in medical technology as well as our ageing population. In March you’ll receive a letter from us providing you with your new contribution amount. From 1 April, any contributions you make toward your membership will be calculated at the new rate, if your plan renews on this date. If you’ve paid your membership in advance of this date, the new rate will take effect from your next payment. Please keep in mind that this increase in your contribution is different to the rate adjustment from the change to the Australian Government Rebate on Private Health Insurance, which also takes effect from 1 April 2019. Please refer to our Member FAQs here to provide you with more information. The Federal Minister for Health released the details of a series of reforms to private health insurance in July 2018 that will be introduced from 1 April 2019. These reforms are designed to improve the affordability of private health insurance and make private health insurance easier for you to understand. To find out more, visit our PHI Reforms page. 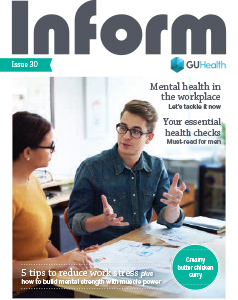 Mental wellbeing is the theme of the latest issue of Inform. Members will shortly receive a copy in the mail or you can check out the online version here. Did you realise that one in five people experience a mental health illness every year? This has a huge impact on the individual, their family and friends and their place of work. Little wonder then that the need to reduce the stigma of mental illness is more important than ever. In this issue of Inform, learn more about the following. It’s time for mental health first aid Mental illness is now impacting the workforce more than physical injury, so the need to provide mental health training is more important than ever. Go to page 20 to read more. Your essential health checks − A must-read for men It’s a well-known fact that men are less likely to see their doctor for a health check-up than women. Go to page 17 to read more about the top male health issues. If you think ‘mindfulness’ is just another health fad, think again. Studies show that the mindfulness technique can reduce the symptoms of depression and anxiety by up to 20 per cent. Go to page 7 to read more. You may also enjoy a chill out playlist to help you unwind which is in the Get connected section on page 26. As you may know, exercise plays a role in stress reduction and GU Health’s Wellness Manager, Gretchen Masters shares her tips on how to build and maintain physical and mental strength on page 12. And, if you'd like to tickle your tastebuds as well as improve your mood turn to our recipes from page 14. To go into the draw to win one of five copies of The SleepWell Guide by SleepFIt valued at $29.99 email your tip for a good night’s sleep to: [email protected]. You can access your 2017/2018 Annual Private Health Insurance Tax Statement from 17 July by visiting guhealth.com.au and logging into your Online Member Services. Go to the Member Login box on the right of the home page, enter your Membership Number and Password or register for Online Member Services. We’ll also post GU Health members their tax statements via mail by Saturday, 15 July. Your tax statement contains important information about any Australian Government Rebate you’ve received on your private health insurance and details of your private health insurance membership from 1 July 2017 to 30 June 2018. This information will be required for you to complete your 2017/2018 tax return. To find answers to some of the commonly asked questions about your tax statement please refer to our Member FAQs. The Minister for Health today made an announcement to release the approved 2018 rates increase for all registered Australian health funds. This review takes into account a range of factors such as the rising cost of healthcare services due to advances in medical technology as well as our ageing population. Effective 1 April 2018, GU Health’s average annual increase is 2.84 per cent. The increase will vary depending on your cover option. In mid-March you’ll receive a letter from us providing you with your new contribution amount. Please keep in mind that this increase in your contribution is different to the rate adjustment from the change to the Australian Government Rebate on Private Health Insurance, which will also take effect from 1 April 2018. For assistance or for more information please contact our Member Relations Team by email: [email protected] or call 1800 249 966 between 8.30am to 5pm (AEST), Monday to Friday.